A mentoring scheme, which reverses the roles of mentor and mentee, could help increase the number of senior BME nurses. A new nurse mentoring scheme, which reverses the roles of mentor and mentee, could help increase the number of senior black and minority ethnic (BME) nurses. Time to change the picture: new scheme wants junior BME nurses to mentor senior, white colleagues. University of Nottingham healthcare leadership, innovation and entrepreneurship associate professor Stacy Johnson outlined plans at the Florence Nightingale Foundation Conference last Friday [3 February]. The so-called ‘reverse-mentoring’ project – to be piloted in healthcare organisations in the East Midlands – will pair up junior BME nurses with senior, white colleagues. Acting as the mentor, junior nurses will be able to offer their colleagues unique insight from a BME perspective, which professor Johnson believes will bring many organisational benefits, including help with sexism and LGBT issues. BME staff are under-represented at senior levels of nursing, said professor Johnson. She added that poor career prospects have traditionally been put down to a ‘skills deficit’ or a lack of ambition, and so solutions have always centred on increasing confidence and ability. After holding numerous workshops, she found that while BME staff appreciated traditional mentoring and job shadowing, there was also a case for training senior staff. She said discrimination can occur accidentally, as senior white staff do not share the same ‘racial lens’. Professor Johnson also hopes reverse-mentoring will better equip managers to deal with disciplinary issues, rather than referring on to the Nursing and Midwifery Council (NMC). The latest figures from the regulator show that 16% of all fitness to practise referrals are for BME nurses, despite them only accounting for 7% of registrants. 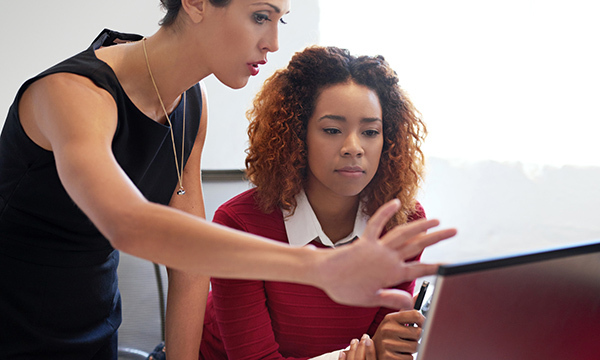 Wider organisational benefits of the new mentoring scheme may include managers becoming more aware of the reasons for certain requests or issues. One conference delegate pointed out that Filipino nurses prefer to take six weeks’ annual leave in one hit, to counter the expense of going home. Professor Johnson said: ‘There is this idea that taking a long period of annual leave means you are not committed to your job. Ms Johnson hopes NHS trusts will buy into the scheme and provide staff with additional time to mentor, given that the Workforce Race Equality Standard requires trusts to show they are improving race relations.